Strangely enough, despite living in Samoa for two years and spending three months eating all the mango and sticky rice in SE Asia, I had never seen a mango tree before. I am not sure why I found how they grew surprising. The entire time I was in Samoa, I didn't eat a single mango. During training, another member of our group discovered that he was allergic to mangoes by developing a full-body rash and swelling. He itched everywhere. In one commiserating session, he compared his allergies to my boils and we both came to the conclusion that we would rather have my boils than his allergic reaction. They told us in training that the mango tree is in the family of poison sumac and poison ivy. Though I am not allergic to poison ivy, I decided I didn't want to take the risk. However, by the time we got to Thailand, I was over my fear. It was probably the mango and sticky rice that did it. Seriously, best food item ever. Sweet. Salty. Delicious. We ate it I think just about every day for breakfast in Chiang Mai. The skin of unripe, pickled, or cooked mango can be consumed, but has the potential to cause contact dermatitis of the lips, gingiva, or tongue in susceptible people. I am a susceptible people. Just like I am one of those lucky few that have a reaction to doxy. Lucky me. When mangoes were first imported to the American colonies in the 17th century, they had to be pickled due to lack of refrigeration. 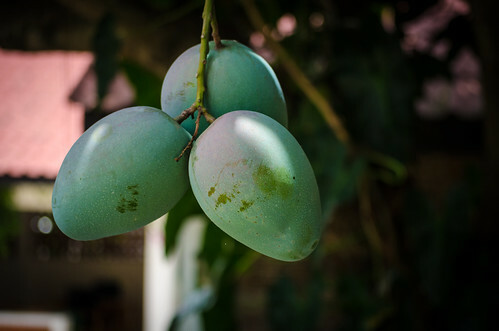 Other fruits were also pickled and came to be called "mangoes", especially bell peppers, and by the 18th century, the word "mango" became a verb meaning "to pickle".